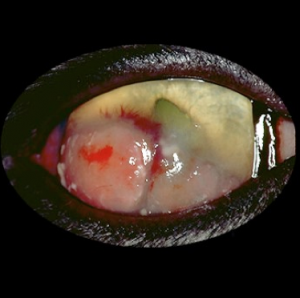 Feline eosinophilic keratoconjunctivitis is an inflammatory condition that affects the cornea and/or conjunctiva. It is characterized by mucopurulent discharge and pink/white raised plaques on the cornea or conjunctiva. Eosinophils are often noted on corneal cytology which confirms the diagnosis. Treatment of eosinophilic keratoconjunctivitis is topical anti-inflammatory therapy with either cyclosporine, tacrolimus, or prednisolone acetate combined with a topical antiviral or oral therapy with megestrol acetate. Side effects of topical therapy include corneal ulceration and bullous keratopathy. Side effects of oral megestrol acetate are rare but include diabetes mellitus, mammary gland hyperplasia and liver toxicity. Most cats require lifelong therapy with either topical or oral therapy. There is a new compounded topical ocular form of megestrol acetate (0.5%) that is showing very promising results. The drop is started twice daily and appears to be very effective. Its results are quick just like oral megestrol acetate but it does not seem to have the systemic side effects of oral megestrol acetate or the corneal side effects of topical anti-inflammatory therapy. The topical treatment with megestrol acetate 0.5% was introduced at the 2015 American College of Veterinary Ophthalmologists annual meeting and we hope to have some long-term data soon.